One of the first challenges most homeschooling parents worry about is teaching kids to read. Once that's done it gets pretty easy, right? Not so much. We all have our own focuses, strengths, and weaknesses. I'm a writing fanatic. My kids are expected to do a lot of writing and I want them to write really well - creative, free writing, 5 paragraph essays, short stories, poems, more essays, etc. I want them to go to college capable of writing and expressing themselves very well. While I can teach the five paragraph essay in my sleep (I LOVED writing five paragraph essays as a kid), I do look for outside help with other areas of writing, such as book reports, poetry, and short essays. Adam (13), Kaden (11), and I were recently asked to review Beyond the Book Report, a DVD based language arts program, by Analytical Grammar. Yes, please! 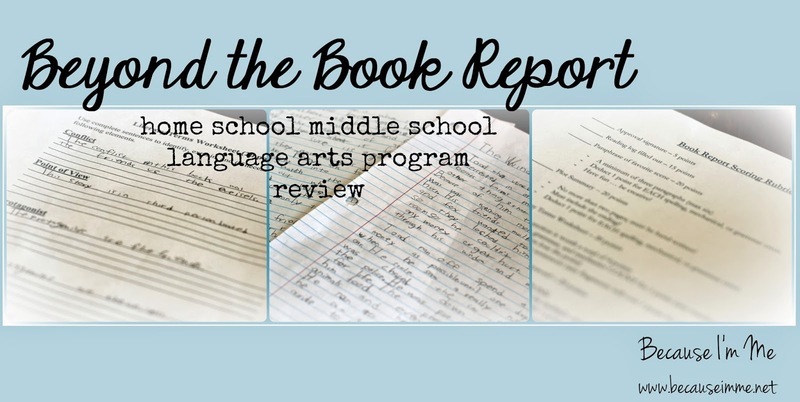 Beyond the Book Report (BBR) is a writing curriculum geared towards middle and early high school students. It can be used in conjunction with Analytical Grammar to provide a complete language arts curriculum or as a stand alone product (we used it by itself). The authors encourage the students to read classics for their "real" book choices, but it's not absolutely necessary. BBR is authored and taught by Robin Finley and Erin Karl, a mother and daughter. Ms. Finley was a language arts teacher for 30+ years and Ms. Karl also taught middle school language arts. Both speak to the students, via DVD, in a manner that really catches the kids attention, keeps them engaged, and teaches them in a manner that allows them to comprehend the material. The program consists of three Seasons, each containing a teacher's guide and instruction DVD for the computer. The teacher's guides are loose leaf pages with pre-punched holes, making it easy to insert into a thin binder (and the DVD's fit right in the binder pocket). Each seasons teachers guide includes a table of contents, suggested schedule, teaching outlines, sample completed workbook pages, additional reference materials, and a glossary of terms. I've shared my frustration with technical stuff before ... I'm proud to say I had no problem working with the DVD once one of the kids showed me how to insert it (don't judge, I'm learning), it was very user friendly (ie - not scary). The DVD's open directly to the contact pages where all other files are listed. Season 1 focuses on writing a basic book report, beginning with literary terms, choosing a book, keeping a reading log, and writing a summary. Then the students learn to write a pamphlet-based book report. The final module explores writing a journalism style book report. The Season 1 DVD includes both the lessons for writing a basic book report, pamphlet book report, and journalism book report as well as all pages that need to be printed for the student (each is labeled as "printable" or "lecture", making it super easy to navigate). BBR Season 2 goes beyond the book report (yes, I'm witty) to teach about poetry and drama. The poetry unit covers many different forms of poetry. The student's book report for this section is the form of four poems - limerick, haiku, sonnet, and a narrative poem. Pretty outside the box, and a cool new idea for me. The second module of Season 2 focuses on writing a drama book report. Students are introduced to A Midsummer Night's Dream. The book report for this module has the students creating a script from a portion of the book they read. BBR Season 3 can be used as a "stand alone" curriculum for college prep high school students, or following Season 1 and Season 2. Season 3 teaches the student about essays, oral reports, and research papers, and works to prepare the student for the essay portion of the ACT. This Season prepares the student for upper-level high school and college writing. After quite a few mumbles and grumbles about doing schoolwork in the summer we got started. To begin I went ahead and printed the worksheet copies for them. I find it's easier to have this type of stuff done ahead of time so it isn't slowing progress later on. The boys were able to work fairly independently with this program, and got quite a way through Season 1, though summer did get in the way. They spent about 15-20 minutes in front of the computer on the days they did lessons. They didn't do lessons every day because they had to also read their chosen books for their reports. Both boys attempted to read classics for this program and each of them got about halfway done with their books, but were hindered by the beach and other distractions (time with Dad, scout camp, vacation time and camping with Mommy, etc) and ended up writing their reports using books that were already familiar to them. However, they aren't off the hook with their classics ... we'll be adding this program to our regular school schedule when we begin our formal school year and they'll be finishing and using those half-read classics then. Ms. Finley and Ms. Karl do a wonderful job teaching the material. The boys are very engaged throughout, only stopping to ask a few questions here and there. They understand what they're learning, even new concepts were sticking. The videos aren't flashy and exciting, but the message is conveyed very clearly and the videos are short enough to not lose the kids attention. I asked both boys if they liked the program and both answered, "yes!" While they did initially complain about doing school in the summer they did not complain about using the program and readily did so when reminded to. I'm pleased with BBR as well, and am looking forward to continuing with it when school starts in a few very short weeks. I really appreciate that the program is teaching the kids some styles they'd never have learned from just me and that they're learning it from someone else -- not that I mind them learning it from me, it's just great for them to get someone else's perspective. Beyond the Book Report is available through Analytical Grammar for $24.95 per season or $69.95 for all three seasons. Each season includes the DVD and the Teacher's Workbook. 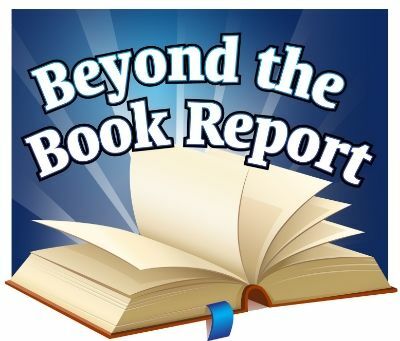 Beyond the Book Report is geared towards kids in middle and high school.